Modern design is design that is clean, minimal, and often times has flare or inspiration from the 1920-1950s. By using it as the design focus for the bar and restaurant design ideas, it lets you keep the bar area simple, and not overdo it. Showcasing the necessities, but in a way that will still stick out to your guests. 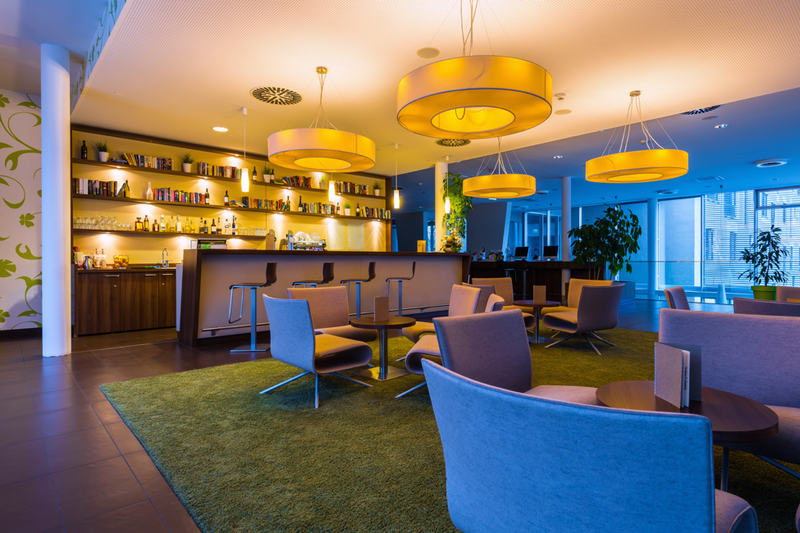 With a modern take on minimalism hotel bars are left bare, figuratively and quiet literally too. Keeping to a natural palette, the only element of color that is seen is through the incorporation of indoor plants. Some bar interiors even get as creative to make it seem as you are sipping on your cosmopolitan in a garden, with great, green vines draped around the bar. Others keep to a simpler look with touches of wood for accent and a planter or two at the bar. The ultimate image of a modern bar interior is all white furniture, giving the room so much negative space. The negative space also works to open up the room and give it an air of lightness. While having an all-white aesthetic to your design, it really lets the colors of the food stand out and opens up the experience for the guests that are at the bar. An all-white bar interior is sure to be a show stopper, and guaranteed to turn a few heads! The other side of the coin to modern design is the use of deep textured wood that adds a sense of warmth to any room. The deep and rich colors work to add in depth, and give the room a more mature look. But to avoid a look that could be considered too mature, hotels are adding in different industrial textures, still keeps it modern, but allows for more creativity and freedom with the design. Hotel bar interiors are like the kitchen of a home, there is constant movement and in many ways is the stomach of the hotel. It is where guests meet up before heading out for the night, or meet with a business guest, or just pass by to get a quick snack. It is important to consider all the different occasions that it’ll be used for, and how the modern design will embrace it all.